Hall of fame fisherman Mick Thill passed away in England on Sunday November 18th. Thill was an accomplished angler, writer, speaker, teacher, and tackle designer. Thill lived most of his life in the Skokie, IL area but also split time with his family in London, England. Competitor: Mick Thill took to fishing at a young age. It wasn’t long before he began fishing competitively in a format known as matchfishing. This sport is an all species bank fishing event where total weight wins. 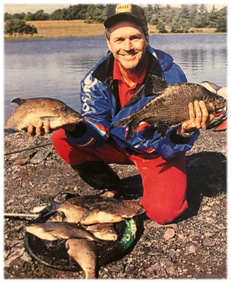 Thill used his creativity and passion to fish his way to a club World Championship with the Essex County angling club from England in 1982. He then pioneered matchfishing and modern float fishing in the United States starting in 1982. As USA matchfishing team captain Mick won individual World Championship Silver in 1982 and Bronze in 1992. Mick started the American Fishing Association to get the USA involved with FIPSed (The international Freshwater Fishing governing body). Teacher: Thill was a tireless proponent of fishing and took every opportunity to share his encyclopedic knowledge of the sport with anyone interested. He used his travels as a competitive angler to learn fishing tactics from all over the globe. His insights into finesse fishing taught anglers how to catch shy biting fish. He partnered with Midwest Outdoors and other publications to regularly explain and diagram fishing rigs and effective bait presentations. Float maker: Mick’s “Thill Gold Medal” floats by Lindy Little Joe are America’s most successful and diverse group of fishing floats. Thill designed these floats to catch a variety of fish. There are floats for lakes and rivers; open and ice fishing; panfish, trout, bass, catfish. If you love to fish and live in the United States chances are that you own one or more of Thill’s floats. Thill’s legacy lives on through them.